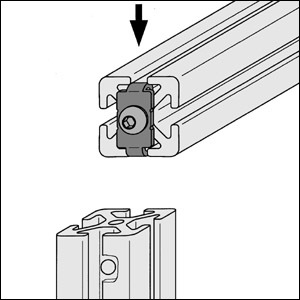 Standard Fasteners are a popular choice for connecting to aluminium profiles at a right-angle. A number of sizes are available which correspond to the line of aluminium profile used. The necessary thread (b) is tapped directly into the core bore of the profile. 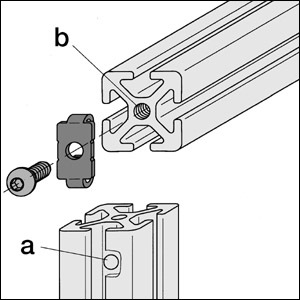 A drill hole (a) is required for the Hex key to access the fastener when it is in place. Position of the through holes for the Hex key. The standard connecting plates can be arranged to match the way in which the profiles are fitted. 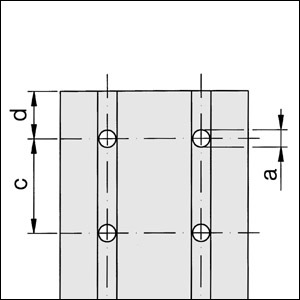 Large profiles with high load-bearing capabilities can be connected using a larger number of Standard Fasteners.